Step Back In Time With A Visit To Skunk Hollow Tavern! A visit to Skunk Hollow Tavern in Hartland Four Corners, VT is a bit like traveling back in time, complete with excellent pub fare! Skunk Hollow Tavern, built circa 1790, is an authentic, country tavern. This popular destination is a diverse venue offering both pub and restaurant settings. You would be hard-pressed to find a more authentic, less touristy place to drink or dine than Skunk Hollow Tavern. The tavern’s building is one of the oldest in the area, with construction that reflects early methods used by the area’s first settlers. Skunk Hollow Tavern is built into the hillside, its face towards the day’s best sun. This method of construction helps to insulate the building from the worst of the weather. Sometime after the building was first built, an English basement was added. An “English basement” is one partially buried and having a separate entrance from the rest of the structure. At Skunk Hollow Tavern, this basement is the Tavern Room. Upstairs is the more formal dining area. The modern kitchen offers both a full menu and a pub menu that can be enjoyed in either space. Skunk Hollow Tavern has been feeding folks since 1985 but the building has been a lot more than that over the last 200 years. Since 1790, it has been home to a butcher shop, a cobbler, a milliner, and a tea room. There are even rumors that it was once a car wash and, on dark, moonlit nights, you can sometimes still hear the ghostly gurgle of the drains. The tiny, 200-year-old, crossroads tavern is probably eligible for the State Historical Registry. The worn wooden floors, crude bricks, and narrow construction simply ooze history and atmosphere. The surroundings elevate the experience, making your burger or a pint of one of the many regional craft beers they have on tap that much better. Visit www.skunkhollowtavernvt.com for hours and a peep at the menu. Deer Brook Inn in Woodstock, VT is less than 30 minutes away from Skunk Hollow Tavern and much of the rest of what brought you here in the first place! 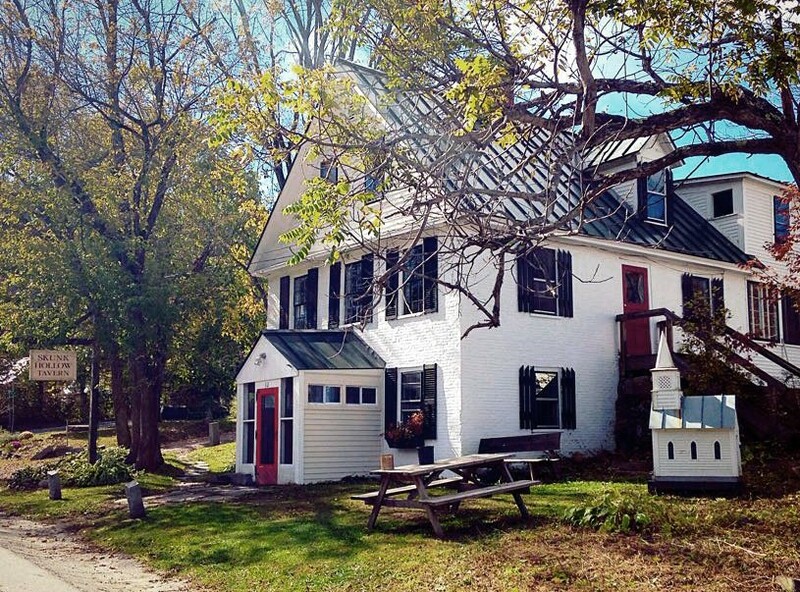 Our stylish, 1820’s farmhouse inn offers distinctive yet Vermont casual lodging. Allow us to provide you with the most comfortable and relaxing accommodations you’ll find outside your own home! Book your getaway today at Deer Brook Farm!